“Who is Velvet Templeton?” That has to be what the people that screwed her over have to be asking themselves. A seemingly innocuous secretary to the director of one of the premier spy agencies in the world, she gets framed for the murder of one of the agency’s top agents. 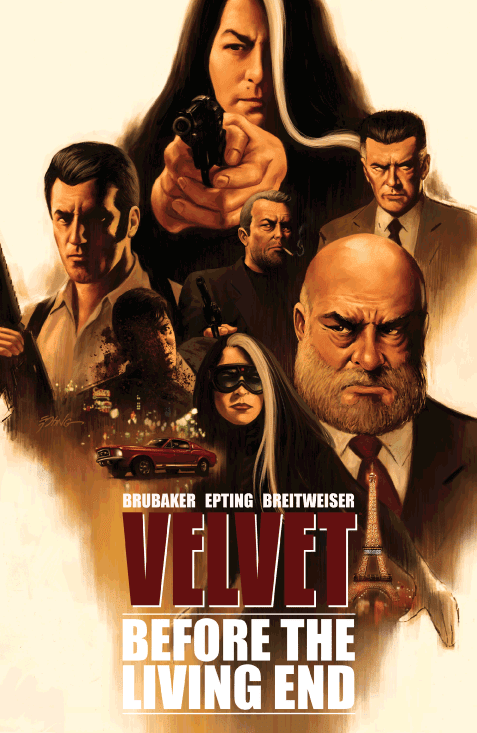 But Velvet has a past that not many know about, a past that could very well cause the men who framed her to consider that they may have bitten off more than they can chew! This first trade collects the first 5 issue story arc called “Before the Living End”. As with most Image trades, it has a very friendly $9.99 cover price. Once they have you hooked (and I’m sure they will), they’ll raise the price of the next trade, the clever bastards! The team of Brubaker and Epting already has a pedigree for fine storytelling. They were behind the Winter Soldier storyline in the Captain America books that brought Bucky back from the dead and paved the way for him to take over the mantle of Cap. You get that same high quality, cinematic storytelling here. This story is a real breath of fresh air from your usual superhero-in-tights tale. Not only is the protagonist a woman, but she’s a very empowered and capable woman in the 50s and 60s (which this story takes place). And there’s no superpowered or supernatural element to this story--it’s just a great spy thriller with lots of action and suspense in the vein of James Bond or Jason Bourne. The writing is typical Brubaker. That’s not a slight in any way, just the truth. When you pick up a Brubaker book, you’re going to get a taut thriller that has you turning the page, waiting to see what will happen next. This is no exception. The man apparently does one thing and does it extremely well! The art duties are by Steve Epting with colors by Elizabeth Breitweiser. Epting’s art is gorgeous, as usual. His style is a perfect complement to Brubaker’s writing. His linework is clean and beautiful. And when a scene calls for dark and ominous, he brings it to life perfectly. I don’t often mention colorists on books. I’ve always felt that if you notice the letterer or colorist on a book, they’re doing it wrong. Their skills should subtle, but add to the overall mood of the book. But I always notice Breitweiser’s work whenever I see it, she manages to be an exception to that rule. She doesn’t get noticed because she’s bad at what she does, quite the opposite, actually. Her colors are vibrant when they need to be or dark and gritty when needed as well. I became a fan of hers from her work on Parker and Hardman’s Hulk, and this work here keeps me eagerly awaiting her next work. The verdict: Highly recommended. This trade is my first exposure to this series and you can be sure I’m going to catch this in issues from here on out. I’m dying to see what happens next! In my opinion, this series has nowhere to go but up.